Here's a book I read last year as soon as it released. I also wrote this review last year, but for one reason or another never found the right moment to post it. Well, since I loved the first book of this series so much, right moment or not... here it is, The Tempering of Men by Sarah Monette and Elizabeth Bear. In Iskryne, the war against the Trollish invasion has been won, and the lands of men are safe again…at least for a while. Isolfr and his sister, the Konigenwolf Viradechtis, have established their own wolfhaell. Viradechtis has taken two mates, and so the human pack has two war leaders. And in the way of the pack, they must come to terms with each other, must become brothers instead of rivals--for Viradechtis will not be gainsaid. 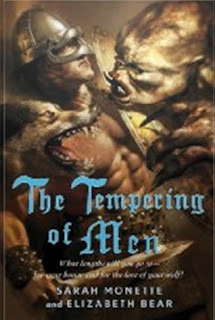 The Tempering of Men is the sequel to A Companion to Wolves and it picks up right where that book ended. As such, it works quite well in my opinion, however, this is not a book I would recommend anyone read as a stand alone as it would not make much sense to the reader. It would be like beginning a story in the middle. And that is exactly what The Tempering of Men is, a middle book without a real beginning or a true end. The Tempering of Men is told from three different points of view, that of Vethulf and Skjaldwulf, Isolfr's wolfjarls and Brokkolfr a new wolfcarl from whose perspective we observe Isoflr. Although the first book focused on exploring the relationship and balance between man and wolf, this book's focus is centered on relationships between the men themselves. The wolves are still at the heart of the story, just not as central as they were in that first book. This was accomplished by eliminating Isolfr and Veredectichs point of view and therefore the pack sense as the focal point. The title very much reflects the story, as counterbalancing or neutralizing situations that arise from relationship between men seems to be its main purpose -- whether it's the relationship between wolfjarls Vethulf and Skjaldwulf, conflicts between the packs or the ever growing and rather delicate relationship between wolfcarls and wolfless men -- tempering is the key word. The new introduction of an invading army of men from a different culture adds to the mix. I thoroughly enjoyed the in-depth look into Vethulf and Skjaldwulf's characters. The way in which the individual characters develop together and apart is a central thread throughout this book, even as events climax and other characters are introduced. However, although I found Bokkflr's view of Isolfr quite interesting and informative, as we get to see him from the perspective of someone who is on the outside looking in I found that Isolfr's perspective is sorely missed in this story. Having previously read Elizabeth Bear's works (I've never read Sarah Monette), I'm familiar with her use of gender bending. That's present in this installment, for example: there is a female character who is a "son" and the head of his clan, but role reversals are found throughout also, one small example of that is the male who is referred to, and takes on the role of, "mother." A new female character is introduced in this story, a captive who on the surface appears to be a woman without power. Yet, she is the one who holds the knowledge that men will need to defeat the incoming invaders. Skjaldwulf rescues, adopts her as his daughter and brings her back to the wolfhaell. Again although she is not a central character, she ties in to that underlying thread I mentioned in my post for A Companion to Wolves about women's roles in this male-centric series. She is also an interesting addition to the cast of already vast characters. That cast of vast characters is one of my problems with this book and series so far -- that and the unpronounceable names. It takes a while to remember all the players in this series, between the wolfcarls, wolves, wolfless men and the rest of the crew. Additionally with the invaders, the authors have introduced new culture(s) (Britons and Roman) on top of the already established Norse (Viking) culture in this series. I'm not sure how or if that is going to effect the overall series. In conclusion, I enjoyed this book and loved the further in-depth development of already established characters and their relationships, world building, and men's perspective. The wolves as the central focus are missed, and I have some concerns about the addition of new cultures to this already complex world building. The Tempering of Men is a middle book and one I don't recommend read on its own. However I recommend the series as a whole, and do recommend that A Companion to Wolves be read first. This is a fascinating series with excellent world building and characters, and I won't miss the next book. ETA: Please do not judge this series by the covers. Unfortunately, in my opinion in this case, the covers do not do justice to the stories -- the one for this book in particular. Fantastic review! I am looking forward to reading this - no, I still haven't read it :( It's such an interesting world. Oh you haven't read it yet? I read it as soon as it released, couldn't wait! It just took me forever to post the review (it has been or draft forever, lol). Since you loved A Companion to Wolves, this is a "must read" for you. The authors really expand their worldbuilding and although I did have a few niggles, I still can't wait for the next (final?) book. Nath, this is a good book and the series is even better! The covers are NOT the best, I agree. I placed a note at the bottom of this review about them because I hate the fact that these books are so great and the covers don't do anything for them. BUT, don't judge the books by the covers, this is an excellent series so far. No problem Hilcia :) I bought the books because they were discounted and I read a lot of good reviews... but when it came to reading them, I just couldn't. Mental block ^_^; So might as well give them to you so you can enjoy them. Also, apparently, the first book is out of print... All I need is find them LOL.